This Chocolate Strawberry Cupcakes Recipe is a twist on one of my favorite treats, chocolate covered strawberries. 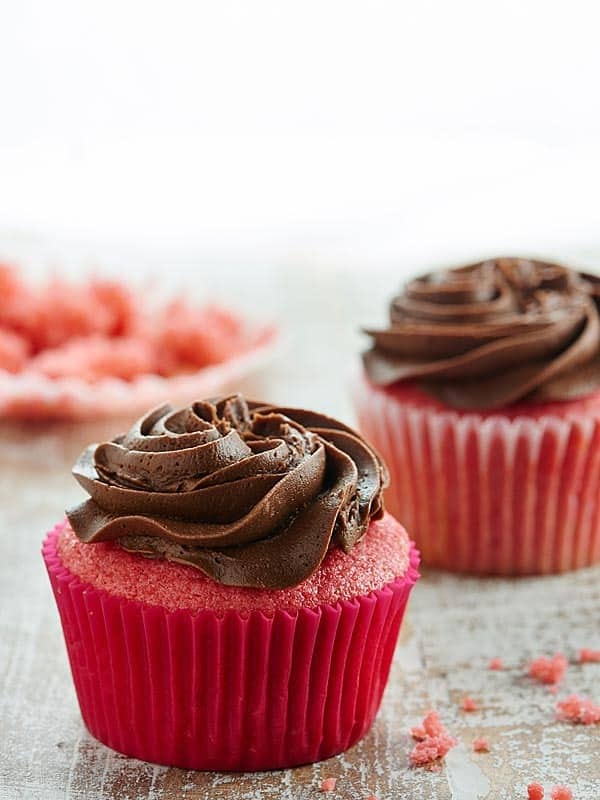 A moist, strawberry flavored cupcake smothered in the creamiest chocolate buttercream. I am a major planner. For example, Trevor and I booked our trip to Mexico nine months in advance. The count down for that trip began at t-minus six months and the menu for each restaurant at the resort had been memorized weeks before we actually got there. 😉 Ok. Maybe not memorized, but . . . you get the idea. That’s why, today, I’m prepping (myself and you) for Valentine’s Day with these Chocolate Strawberry Cupcakes. If you’re thinking it’s a tad too early to start thinking of Valentine’s Day, have no fear, because it’s never too early to start thinking about cupcakes, my friend. Especially these cupcakes. 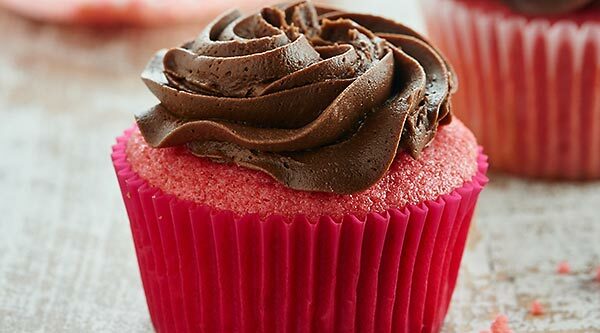 These are moist, fluffy, strawberry cupcakes with the creamiest, fluffiest, chocolate buttercream frosting. Like I said, it’s never too early to start thinking about cupcakes. Amiright? Let’s break these cupcakes down, shall we? It starts with a strawberry cupcake base. It has all your standard cupcake ingredients: sugar, butter, eggs, flour, salt, baking powder, and vanilla. But to that, I add a package of strawberry flavored Jello (whaaat? ), whole milk, whipped egg whites, cornstarch, and strawberry puree. The first time I recipe tested this chocolate strawberry cupcakes recipe, I just used strawberry puree…while they were delicious, they weren’t quite as strawberry-y as I would have liked them to be. Plus, they turned the cupcake a horribly ugly grey color. The fix? A package of strawberry flavored Jello! 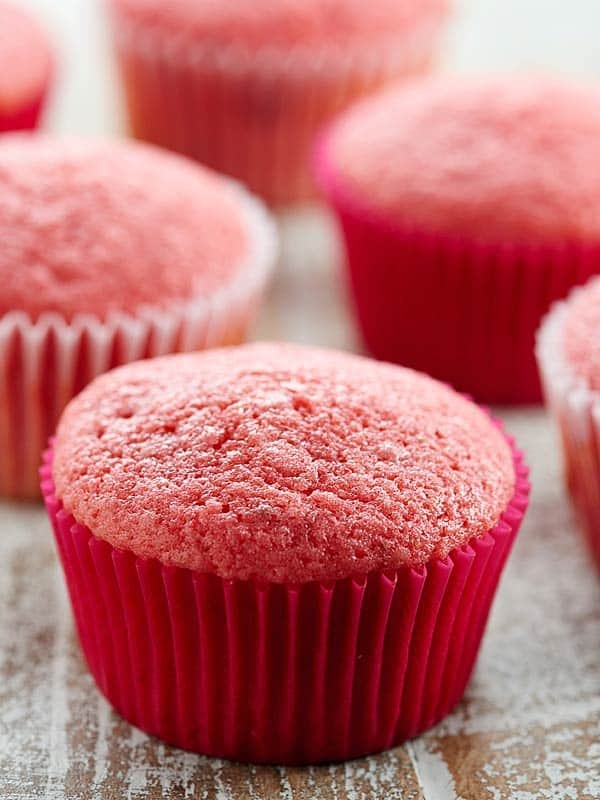 It adds a great strawberry flavor and amazing pink color to the cupcakes. 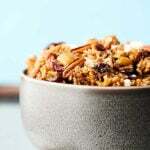 I also use whole milk in this recipe. I highly recommend you use whole milk. I know it’s kind of a pain, because you might not keep it on hand (I know I don’t! ), but it really makes for a super moist cupcake. Next, I use whipped egg whites and cornstarch. This combo makes for a really fluffy cupcake. This strawberry cupcake is tender, moist, fluffy, perfectly strawberry-y, and the best pink color I’ve ever seen. Seriously. It’s kind of awesome. Now for the frosting: a chocolate buttercream frosting. All you need to do is beat butter until it’s fluffy, then beat in powdered sugar, cocoa powder, a pinch of salt, vanilla, and whole milk. Try not to eat it all straight out of the bowl. It’s tempting, but trust me…the strawberry cupcakes go from amazing –> ridiculous with the addition of the buttercream. You guys. I’m telling you, whether you make these for Valentine’s Day or any other day, you will not be disappointed. A fun play on chocolate covered strawberries, these chocolate strawberry cupcakes will surely impress! What’s your favorite cupcake flavor? Show me the yummy! 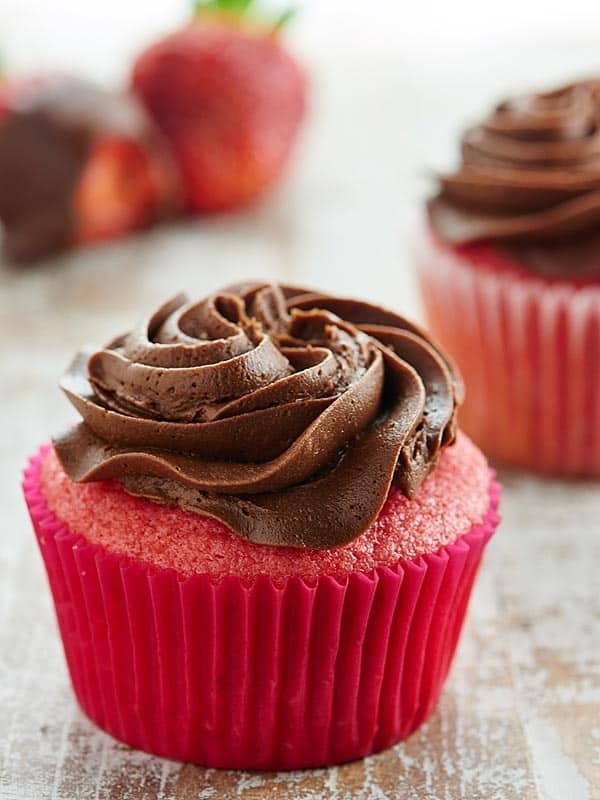 This Chocolate Strawberry Cupcakes Recipe is a twist on chocolate covered strawberries. 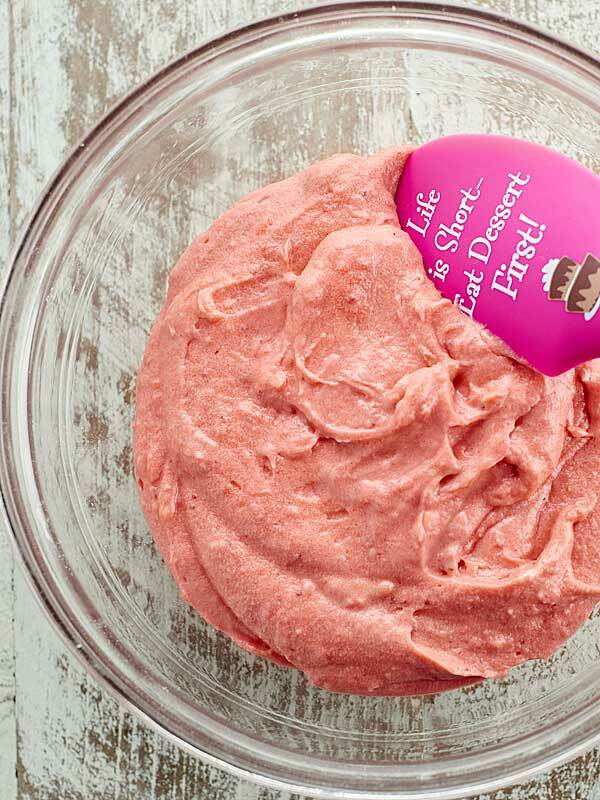 A moist, strawberry cupcake is smothered in the creamiest chocolate buttercream! With a stand or handheld mixer, whisk the two egg whites on high speed in a bowl for about 2-3 minutes, or until soft peaks form. Set aside. Preheat the oven to 350 degrees F and line a standard 12 slot muffin tin with liners. Sift together flour, cornstarch, salt, and baking powder. Set aside. In a large bowl, cream together the butter, sugar, and strawberry jell-o powder until light and fluffy, about 2-3 minutes. Beat in egg yolks until just combined. Stir in milk, vanilla, and strawberry puree. Stir in dry ingredients until just mixed. Don’t overmix. Using a spatula, gently fold the whipped egg whites into the cake batter. Divide the batter evenly between the prepared muffin slots (I used a cookie scoop). Bake for about 10-17 minutes in the preheated oven, or until a tooth pick inserted into the center of the cupcakes come out clean. Remove from oven and place the cupcakes onto a wire rack to cool completely. Cream butter until fluffy, about 2 minutes. Beat in rest of the ingredients until fluffy. 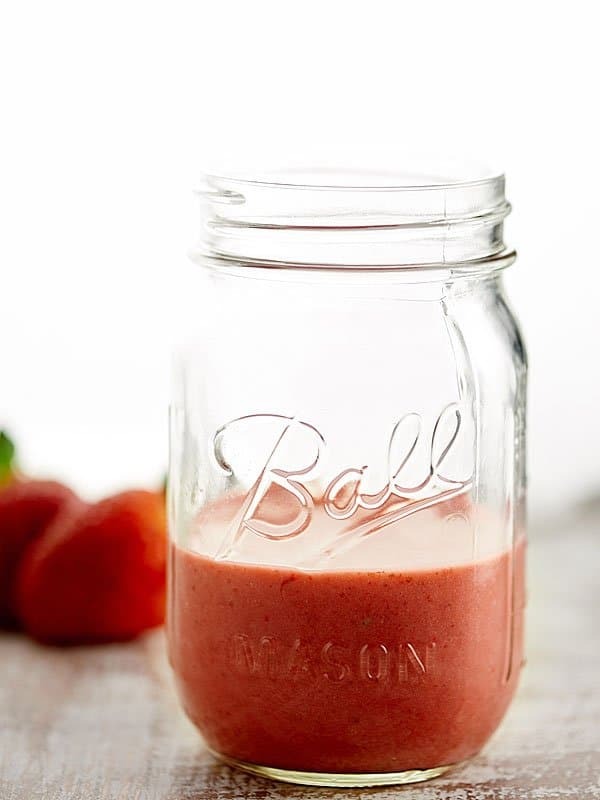 *To make strawberry puree: place fresh (or frozen that have been thawed) strawberries into a high powdered blender and blend until smooth. I needed about 1/2 cup strawberries to make 1/4 cup puree. I had to scroll through the email that I got from you this morning very fast just to see if there are the magic words about the video or not. And yeay! Video! Love it again! I always look forward to your videos! The cupcakes look super delicious and moist and I’m sure amazing especially with the buttercream!!! Thanks so much Julia!! 🙂 I’m so happy you’re enjoying the videos…we had a ton of fun with this one! Hi Geeta! You might be able to replace the eggs with 1/2 cup applesauce …though I can’t vouch for the results, since I haven’t recipe tested this without eggs. If you give it a try…let me know! You could also check out my Vegan Flourless Chocolate Cake (no eggs). 🙂 I hope that helps! Oh my freakin goodness I want like a dozen of these STAT! 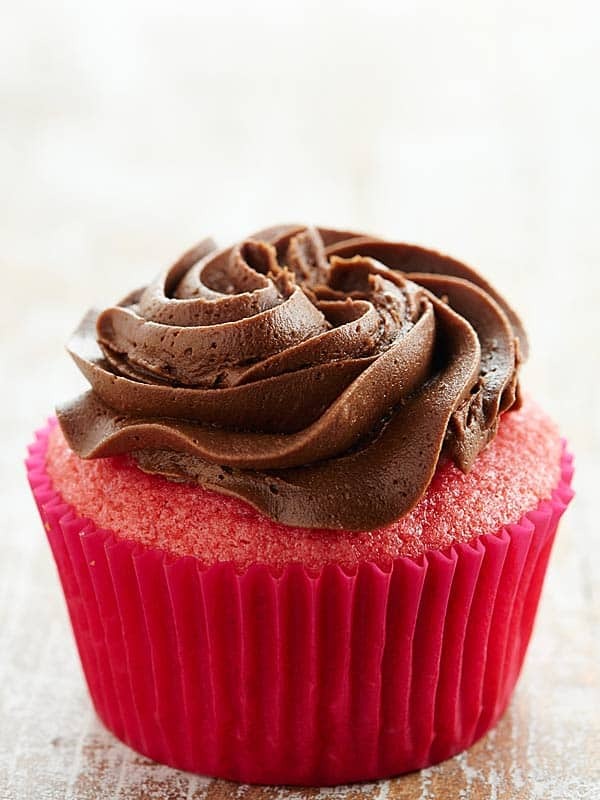 I love that these cupcakes are strawberry flavoured with chocolate buttercream, rather than the other way around. And they look so light and fluffy and delicious. I want. awesome recipe. 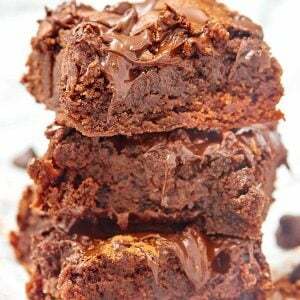 But a question – can I bake as a sheet cake?? I love to plan, too! My family thinks I’m a little crazy – I should just go with the flow. But then nothing will get done!!! I’m so in love with these cupcakes. Strawberry and chocolate is the perfect Valentine’s combo!! If I double the frosting recipe, is it possible to substitute one of the sticks of butter with a stick of cream cheese? I find straight buttercream seems to be too slippery on ky tongue, but I don’t want to ruin the chocolate flavor. Hi Sarah! You could do 4 oz (half a package) of cream cheese and probably be just fine! 🙂 Let me know how it turns out!! Oh my! Just made this for my niece’s birthday and they are amazing! Tastes just like a chocolate covered strawberry. I garnished the top with a sliced strawberry – looks so pretty. Yay!! Thank you so much Karen! What a fun idea for a birthday 🙂 I hope your niece enjoyed them as well!! 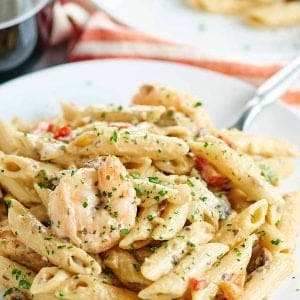 Great recipe.I have a question though,is it supposed to be moist or dry? hi can i make this with out the strawberry puree? Hi Pamela! That should be fine 🙂 I’d love to know how it works out! Hi Jennifer i will let you know by tomorrow. I will be trying it out tomorrow. I am very glad for your reply. By the way i live in South -America. Suriname.
. Everyone loves it thanks a lot. Do you have a lemmon cake recipe for me? Hi Pamela! So happy you love the cupcakes 🙂 Here’s my Lemon Lava Cake Recipe or my Vegan Lemon Cupcakes that you might enjoy.